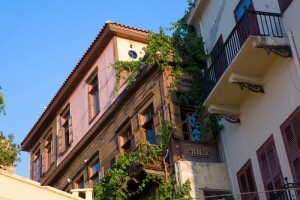 A welcoming and authentic corner of Crete awaits you to discover its secrets step by step. Beaches of endless beauty, a picture-perfect lighthouse at the port, impressive buildings and the largest gorge in Crete are just some of the attractions which will make you fall in love with Chania. From the old town, to exotic Balos beach and the world-famous Samaria Gorge, Chania will treat you to raki and unforgettable adventures. Chania will steal your heart. Romans, Byzantines, Muslims, Venetians, Ottomans… all came through here, creating a multicultural corner of Crete. Wandering around the port, you’ll encounter the Venetian lighthouse, the Grand Arsenal, Kum Kapi and Halepa. You’ll enjoy luxurious accommodation in elegant villas, pulsating bars and restaurants, as well as significant cultural sites. Beyond the town of Chania are the famous beaches of Agia Marina, Stalos and Platanias. Go a little further and you’ll find the exotic beaches of Balos and Falasarna. In southern Chania, the world-famous Samaria Gorge invites you to explore it. So much to do, so little time! Chania has an airport and the port of Souda, the largest natural port of the Mediterranean. The Municipal Market is one of the most central spots in the city, as is the Municipal Garden. Here a plethora of cultural events are organized every year such as exhibitions, festivals, theatrical, musical performances and many more. The noble Old Venetian port provides a pleasant walk through picturesque streets and alleys dotted with stalls, coffee shops and restaurants. Narrow passages surrounded by elegant neoclassic buildings built in different historical periods offer visitors pleasant routes to discover during their holidays in Chania. With its endless sandy beaches, wild gorges, caves, endemic plants and animals, vast olive and orange groves and the combination of wilderness and sea, Chania excites even the most discerning travellers. The mountainous inner region, hosts villages that time has forgotten, scattered churches and monasteries, towers and castles. The whole area is an archaeological site and a paradise for wandering, climbing and sports. Excavations, both in the town of Chania and in the countryside, have un-earthed the existence of settlements from the prehistoric era to the present. SeaCrete hotels offer the perfect base for all-inclusive holidays in Crete as their privileged location allows for thrilling island excursions and exciting adventures throughout the region. After the occupation of the city by the Turks (1645) several changes occurred that influenced the structure of the city and the living conditions in general. The Turkish population settled mainly at the eastern districts of Kasteli and Splantzia. The Christian population settled mainly at the district of Topanas, on the northwestern part of the city. The name “Topanas” derives from the Venetian powder magazine (in Turkish, “Top-Hane”) that was located on the street “Theotokopoulou”. In about the end of the 19th century, the district of Topanas featured beautiful houses, narrow streets and magnificent Venetian buildings. The Consulates of the Great Powers were located there, and later they moved to the district of Halepa. Nowadays, the district of Topanas features a variety of centers at the sea front, ideal for the social gatherings of the people of Chania. The “Firka” (meaning “military unit”) fortress is located on the northwest part of Topanas. Tabakaria, the place of processing of hides, developed in the rocky eastern region of Chania before the mid-19th century, far from the walls of the city – although evidence for the establishment of tanneries in Chania existed since the 18th century. The main installation of these craftsmen in the area, held during the Egyptian occupation (1830-1840), according to official Arabic document. The place chosen for installation was the most appropriate: The reason for choosing this area was that it was quite far and yet near the city, in a location where there are plenty of underground brackish waters beside the shallow sea that were useful for the first stage of processing. The first installation was in the coastal section of road Vivilaki and later (after 1920) was extended to the east (“Agia Kiriaki” – Holy Sunday). The Interwar period was the era of the heyday of Tabakaria. During the German Occupation tanneries stopped functioning while post war new machinery equipment replaced older methods and modernization made crafts more productive and profitable. Significant share of turnover accounted exports. The decline came in the 70s, to reach nowadays remaining alive about one tenth of the initial operations. Remaining buildings, shells, sometimes with the whole old equipment, monuments today of the industrial archeology. Today from tanneries others are abandoned, others have changed use and some of them continue their operation. The element that has not changed over time is the architecture. Adapted to the natural inclinations of the landscape, tanneries are ground floor with entrance from the street and two or three floors from the side of the sea. Built with stone and tile roofs, are arranged in a row, and interrupted only by a very narrow steep passages with steps down to the sea. Constitute a unique architectural ensemble. In the mid-19th century the village of Halepa was extending east from the city, outside the city walls. The area played an important role in the history of Crete, as the famous “Halepa Agreement” was signed on October 1878 between Ottomans and Cretans for the assignment of a limited autonomous regime in the island. The street “Halepas” (today the street “El. Venizelos”), the main street outside the city walls, started east from the city of Chania and ended at the aristocratic suburb of “Halepa”, the wealthy residential area of Chania. It was a neat street, with blue acacia trees. In Halepa, there were luxurious and beautiful buildings, as well as the consulates of the Great Powers. There was also the school of “San Joseph”, where nuns taught French and “savoir vivre” to the rich girls, as well as the elegant church of Aghia Magdalene with its beautiful gardens. In the exterior of the east Venetian walls, near the sandy beach, a village of poor North African slaves and Ottomans was built. They lived in tents and huts and did all the harsh jobs in the portside. This region was called in Turkish Kum Kapisi (Gate of the Sand) from the Venetian gate which is still preserved in our days. Today “Koum Kapi” is one of the most developed districts of the city which gathers thousands of visitors every summer who come to enjoy the view to the sea and the numerous high quality cafeterias and restaurants. Important specialized building, erected in the period of the Cretan State. It is cross-shaped in plan, influenced by the buildings of the so-called Iron Age of the 19th century, which characterizes the period of the Industrial Revolution. The building is distinguished by its elegance and good balance and preserves in schematic form the typical features of the late Neoclassicism. The building of the Market was founded on April 14, 1911 by the Municipal Manolis Mountakis and was inaugurated on December 4, 1913 by the Prime Minister, Eleutherios Venizelos, during the celebration of the Union of Crete with Greece. Since then it has been used as the town’s public market. 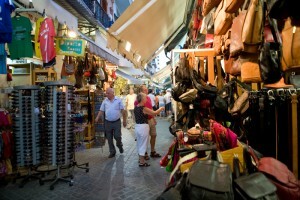 The Municipal Market of Chania, the large building of 4000 square meters in a surrounding area of 17.200 square meters, is the “heart” of the city. It is an original building that, apart from a business activity center, also provides a concrete image of the ancient Greek marketplace. The design and construction of the Municipal Market was a time-consuming procedure that started in 1908 and was completed in 1913, the year when Crete was united with Greece. The official opening ceremony was performed by the Prime Minister of Greece, the notorious Eleftherios Venizelos, three days after the unification of Crete with Greece, on December 4, 1913. The spaces were organized according to special regulations, and the association “New Market of Chania” was founded by the business-holders. In general, on the eastern and western part of the market there were butcher shops, on the end of the west arcade there were the fish shops and on the north and south ends there were the fruit and vegetables shops. Few days before the Battle of Crete, on May 1941, a bombing shelter was constructed on the southeast part of the market. During the German occupation, the German soldiers occupied the central arcade and used it for the needs of the army. In 1980, the Municipal Market of Chania was declared a protected monument by the Ministry of Culture. In order to arrive at the nearest beach from the city of Chania, the coast “Papanikoli” (“Akti Papanikoli”), you must follow the street by the sea from the Venetian port to the west, passing by the West Trench. The beach is at the end of the “Nea Chora” district, a developing area that extends to the northwest of the city of Chania. To the left, there was a large building complex, the old soap factory of “ABEA”. Its high funnel is still preserved. Across the factory there is the National Water Sports Center of Chania and the Nautical Association. In the district of “Nea Chora” there is a small fishing port and a clean sandy beach. Lengthwise the beach there are several good quality fish taverns. The “Sardine Festival” is organized every summer at the beach of Nea Chora, with traditional music, dances and free fish for the visitors. “Santrivani”, the Plateau of Mavrovounio -as it was called when Crete was an independent State, (today the plateau El. Venizelos), despite its small size it has been the most popular plateau, a central place and meeting point for the people of Chania who gathered there to discuss and socialize. It was marble-paved, with cafeterias, hotels, social clubs and modern stores. It is named after a large fountain, decorated with lion heads. Part of the fountain is hosted in the Archeological Museum of Chania. On the north side of “Santrivani” there used to be buildings that were later destroyed during the 1932 fire, and in this way, a front to the sea was created. There were two passages, a narrow passage for the pedestrians on the northeast side, through an arcade shaped by the buildings, and a wider passage for the carriages and carts. Today, there is a modern marble fountain at the plateau. Splantzia was the Turkish district of Chania. In old designs it is recorded as Ponte de Viari and was the central gathering place for the Turkish population -like “Santrivani” was for the Christians. 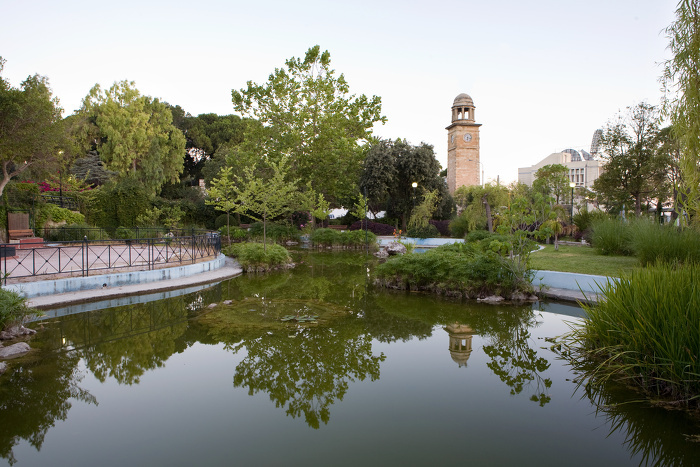 Under the high plane tree (where many Christians were executed during the Turkish period) and near the elegant Arabic kiosk at the center of the district, there was an underground water tank. Splatzia was known as the Turkish plateau of Chania, surrounded by gardens, Turkish coffee shops and stores. A bit further, there is the Church of Aghioi Anargyroi, while behind the street “Tsouderon” there is the Mosque Aga Tzamisi. The present Cathedral temple of “Eisodion” was built on the place of an older temple of “Theotokos” (Virgin Mary), dating back to the 14th century. When the city of Chania was occupied by the Turks in 1645, the temple was converted into a soap-factory without altering its initial design. Until 1868, the temple functioned as a soap-factory and belonged to the Turkish dignitary Moustafa Pasha Giritli (=the Cretan). In the area of the olive storage room, Moustafa had ordered the protection of the icon of Virgin Mary with a vigil candle. According to tradition, the soap-factory business failed and was abandoned, and the icon of Virgin Mary was taken by the last technician. When Moustafa became Prime Minister, during the reign of the Sultan Metzit, the Christian Community requested the re-construction of the temple in the place of the soap-factory. Moustafa assigned the area for this purpose and the Sultan and Veli Pasha (the Commander of Crete) provided monetary support. Despite the hostility between the Christians and the Ottomans, this contribution was appreciated and the church was finally re-built. The construction of the church was completed in 1860 in the style of a three aisle Basilica. The middle aisle is higher and covered by a pointed arch. The other aisles are covered by cross-ribbed vaults and are divided vertically by the women’s balcony. On the northeast side of the temple there is the high bell-tower. The architectural elements of the temple are associated more with the tradition developed in the period of the Venetian occupation: sculptured pseudo-pillars, cornices and arched openings. The east wall is decorated with large and impressive religious paintings, the works of G. Kalliterakis, G. Stravrakis, E. Tripolitakis and D. Kokotsis. The icon of the Virgin Mary (“Eisodion tis Theotokou”) was also returned to the temple. The temple is closely connected to the historical events in the city and it was an asylum and shelter during war time and revolutions. It was severely damaged in May 1941 by the bombs dropped by the Germans. The fortress on the northwest side of the port was constructed to protect the entrance of the port and maintains its Turkish name “Firka” (Firka=barracks). A chain from “Firka” to the lighthouse blocked the entrance to the port in case of intrusion. The fortress was the headquarters of the Army Commander of the city. In the interior, the spaces were organized to barracks and ammunition storage areas. On a door case of the 1st floor there is the inscription “ALOYSIUS BRACADEUS PROVISOR CYDONIAE M.DCXX”. The buildings of the west wing have two floors with domed chambers. In about the middle of the courtyard, there is a large water tank that gathered rain water from the roofs. From the years of the Turkish period until recent years, the “Firka” fortress was used as barrack, but also as a prison. On the corner watch tower the Greek flag of the Unification of Crete was raised on December 1st 1913. The king of Greece, Konstantinos and the Prime Minister Eleftherios Venizelos were present, as well as the Admiral Kountouriotis, the survivor leaders of the Cretan revolutions, and a large number of people. Nowadays, this anniversary is celebrated with an official ceremony and re-enactment of the event. The grand Temple of the monks of the Dominican Order in Chania was built in about 1320 by the fraternity of Candia. Its architecture resembles the one of the Central Temple of Aghios Petros. The original monastery, as portrayed in old maps, images and descriptions, consisted of the temple with a high bell-tower and a two-floor arcade on the north side. The church was a basilica with a central aisle. The central part of the sanctuary is covered by crossed domes with prominent ribs, while the side parts are covered by pointed arches. The roof of the rest of the church was made of wood and had two sloping sides. An arched opening led to the arcade with the habitations of the monks. Nowadays, from the building complex only a damaged catholic is preserved, and a part of the west arcade on the northern side (street Hatzi Roussou Vourdouba). In the years of the Turkish occupation the church was converted into a mosque, the Hiougkar Tzamisi (the Mosque of “Igemonas”, meaning, “The Sovereign’s Mosque”), which was the central Mosque of the city. Its importance is highlighted by the existence of two- instead of one- balconies on the minaret on the southwest corner of the temple. The morphological elements of the minaret are of great interest, as they follow the Venetian tradition. During the 18th century, an underground fountain was built at the square in front of the Mosque, necessary for the ritual washing of the believers. In 1918, the Orthodox population of Chania took over the temple and dedicated it to Aghios Nikolaos (St. Nicolas). Then, a semi-cylinder arch was added on the eastern side. During the ‘50s, a failed renovation caused damages on the wooden roof and led to the reconstruction of the roof and part of the interior. The temple of Aghios Rokkos is preserved in an excellent condition on the northwest corner of the Splantzia plateau, near the temple of Aghios Nikolaos. It consists of two domed aisles of different morphology, from which the oldest is the northern, a simple construction without any decoration. On the contrary, the southern aisle has been entirely made of carved walls, according to the doctrines of Venetian Mannerism. In the temple there is an inscription: “dedicated to the excellent and grand God and to the divine Rokkos 1630”. The inscription “D(IVO) ROCCO” (divine Rokkos) is also found in the entrance. The temple was probably built after a plague, as it is commonly known that Aghios Rokkos was the protector against plagues. A parish temple located on the homonym district of Aghioi Anargyroi, which is recorded from 1583 in Venetian documents. Despite its small size, the district is represented in most of the city’s images. After the occupation of Chania by the Turks in 1645, it was the only Orthodox Church in the city until the 19th century and is now used as the headquarters of the Bishop of “Kydonia”. Most of the activities of the Christian community were organized around the temple during the Turkish period, such as schools, charity organizations, the habitation of the Bishop, etc. Most of these impressive buildings are still preserved around the temple. The church consists of three parts, from which the southern is the most recent extension of the Venetian noble house, where the temple was initially incorporated and was probably a private chapel. The excavation works have revealed that the domed eastern part was built first. Later, an extension was constructed on the west side, and then a larger aisle was added on the north side. Finally, an extension was added to the south. Most of the decoration of the temple dates between 1837 and 1841, as indicated on the inscription of the wood-carven iconostasis. During the recent preservation works, the initial inscription was uncovered, which records the names of the Venetian rector of Chania, Nicolaus Venerio and Georgios Stavrianos as dedicators. The icons were painted in about 1625 by the monk Amvrosios Emporos from Chania and other painters of west Crete and are of particular interest. The icons were dedicated by the Venetian officer and by the citizens to the new local Saint Aghios Ioannis the Hermit, asking for his protection from the Turkish threat. It is located in a short distance from Aghios Nikolaos of Splantzia. It is a two-aisled structure with a front that ends to a gable. The base of the bell-tower can still be seen in the yard. The door-frames are supported by chiseled pseudo-pillars and are crowned with gothic relief arches. In the interior, the vertical surfaces of the walls are separated by corniced arches. In general, the architecture of the temple marks the transition period from the post-gothic to mannerist architecture styles, which leads to the conclusion that the temple was built during the second half of the 16thcentury. In comparison to the rest of the Orthodox temples of Chania, here we can witness architectural elements that predominate in Catholic temples. During the Turkish period the temple was used as a bakery, and until recently it was used as a repair shop. Nevertheless, the locals continued to worship Aghia Ekaterini (St. Catherine) there. In the recent years, the temple was recovered and renovated by the Archeological Service, and became once again a site of worship, dedicated to Aghia Ekaterini and Aghios Ioannis the Hermit. According to the doctrines of Islam, the cleanliness of the body is a very important religious duty. The cleansing of the body symbolizes the cleansing of the soul, according to the Koran. The public bath (hamam) is a very old Ottoman institution and public baths were established in all the regions of the Ottoman Empire, including the island of Crete. Therefore, many public and private baths (hamams) and fountains were constructed in the city of Chania during the Ottoman Empire. The hamam located on the street “Halidon”, near the site of the Roman baths with the beautiful mosaic floors, is a multi-vaulted building with an arcade that was demolished in 1941. The hamam had a second floor and was built on the position of the Venetian monastery of Aghia Klara. This building complex is located on the street “Halidon” and hosts the Archeological Museum of the city. The building is preserved but most of its part have been renovated with many modern interventions. On its southern side there was a double arcade (chiostro) with the rooms of the monks and other buildings. Nowadays, the larger part of the arcade is incorporated and occupied by the houses and stores that extend until the entrance of the newer Catholic Temple. On the northern side of the church of Aghios Fragkiskos, the existence of a beautiful garden is recorded on a map of the time, similar to the one preserved today from the time the church was converted to a mosque. The recent renovation works have revealed the different construction phases of the temple, some of which are in line with the urban development and reconstructions of the city through time. A part of the initial design of the temple is still visible in the middle of today’s temple. Later interventions include the construction of three chapels on the northern side, covered by cross-ribbed vaults bearing the gothic monogram of Christ in their center, and the re-modeling of northern front of the temple. In 1605, the extension of the temple to the east probably took place, which is obviously connected to the creation of Ruga Magistra (Halidon Street) during the city’s reconstruction and the construction of the new fortification walls. Another extension of the temple was probably realized during the Turkish period, with a construction to west. The base of the bell tower is preserved on the eastern side of the monument. During the Turkish period, the temple of Aghios Fragkiskos was converted into a mosque, the “Giousouf Pasha Tzamisi”. Then, the minaret and the octagonal fountain were added in the courtyard. In the later years, it was again converted into a cinema and an entertainment center. In 1252, the prefecture of Chania was divided in 90 feuds assigned to the Venetian settlers, who in return were ordered to reconstruct the city of Chania. The Venetians settlers then constructed the wall of “Kasteli” and organized the urban plan of the city within the walls. A new modern city was then constructed, within the city walls. Gradually, the city extended outside the old fortress, and the reconstruction and modernization of the city walls was also necessary. Thus, in the mid-16th century the city was re-fortified under the supervision of the famous for his fortification works Μichele Sanmichielli, who designed modern walls with a trench, which was never filled with water. Within the new limits of the city -which also included the portside-, a better urban plan was designed and temples were built or renovated, as well as large public and private buildings according to Venetian standards. The city of Chania evolved into the second city of “the Kingdom of Crete”, it became the headquarters of the Rector and of the Latin Bishop. The city and its port became the center of a rich agricultural region, with strong economic and cultural relations with Venice. Parts of the city walls are still preserved, while recently renovation works are conducted in order to maintain the beauty of the old city. The San Salvatore Rampart is located on the northwest corner of the Venetian walls. It was connected with the ‘Firka’ fortress, where part of the circular tower from the initial fortification of the port is preserved, constructed by the Genoans in the beginning of the 13th century. The tower was incorporated in the later fortifications. Near the tower, there is the Monastery of San Salvatore. In about 1595 -1601, a lighthouse was constructed by the Venetians, which was founded on a natural rock and functioned as open flame torch and it is recorded in a 1689 city plan of Chania by V. Coronelli. An opening was created on the rocks to allow the water renewal and to avoid earth fillings, and in its center the Aghios Nikolaos was built. The rampart covered the long distance until the entrance to the port, and was used to protect the port along with the fortress of “Firka”. During the same period, the tower of the lighthouse was also built, which is still preserved today. Its architecture is influenced by the local tradition of this period, as it was formed during the Venetian period. During this period, the lighthouse took the formation that we still witness today. The tower is divided in three diverse parts: the base is octagonal, the middle part has sixteen sides, and the third part is circular. The construction material of the base is of the same origin and quality of the material used for the fortification of the city of Chania by the Venetians. According to the valid English 1847 and 1859 “lighthouse-indicators”, the lighthouse was restored -on its Venetian base- and in 1839 it functioned according to the new technologies of the time. According to references, the new lighthouse was different from the initial. Its shape and interior staircase looked more like a minaret. For this reason, this monument is not related to the standard-style lighthouse towers. Plus, it consists only from the tower and it does not have the guard house, as most of the lighthouses. This is probably because it is built near a residential area, and therefore there was no need for a guard house to supervise its functions. However, at the end of the 19th century, a guard house was constructed next to the base of the lighthouse, which was later demolished, before 1967. In 1864, the lighthouse was assigned to the French Company of Ottoman Lighthouses, and during the final years of the Turkish occupation, the staircase of the east side was constructed, in the entrance of the lighthouse tower. Recent renovations include the octagonal watch house with the small dome, and the water pipes under the base of the lighthouse. The lighthouse, the jewel of the city, is 21 meters high and its light covers a distance of 7 miles. It is one of the oldest lighthouses that are still preserved today, not only in Greece and the Mediterranean, but also in the world. A bright example of Islamic art of the Renaissance, distinguished by its uniqueness, Giali Tzamisi is the only from preserved Mosques of the city that was built during the second half of the 17th century. It was built to honor the first Sergeant of Chania, Kioutsouk Hassan, and the studies conducted by the 13thEphorat of Byzantine Antiquities concluded that on its position there used to be a small temple. The Mosque is a cubic building covered by a large hemispheric cupola, supported by four elaborate stone-made arches. Its west and north side are surrounded by an arcade covered by six small cupolas. Initially, the arcade was open, as is usual in the mosques. In 1880, the arcade was covered, it had arched openings and developed a neoclassic style. The Mosque Kioutsouk (meaning “little”) Hassan or Giali Tzamisi (meaning, the Mosque of the Seaside), as it is commonly known, was the work of an Armenian architect, who had constructed a similar Mosque in the village “Spakiano” in “Selino”. The Mosque also had a courtyard with palm trees and graves of janizaries and it was closed in 1923. Nowadays, the Mosque has been renovated; however its small picturesque minaret was demolished in 1920 (or in 1939). The Archeological Museum of Chania was hosted there, after many adventures due to war, with the care of the famous professor Nik. V. Tomadakis. Later, the Mosque was used as a storage place, a Museum of Folk Art, a Tourist Information Office and recently, as a space for exhibitions and events. During the Venetian occupation (1204 – 1669), the need for the closer presence of Venetian navy in Crete obliged Venice to construct the “Neoria” (arsenal), a dockyard where the ships would be maintained during the winter. In 1467, Venice ordered the construction of a number of “Neoria”, two per city (Chania and Rethymno). The construction of the first two “Neoria” in Chania was completed in 1526. In 1593, sixteen “Neoria” had been constructed. In 1599, the south “Neoria” complex was completed with the construction of the 17th “Neorio”. In 1607, at the same time when the northeast rampart was extended, the construction of 5 more “Neoria” at the heart of the port begins, which are commonly known as “the Neoria of Moro”, named after the General Intendant who suggested their construction. Two of the five “Neoria” were completed, and walls were also constructed. During the Turkish period, the lack of maintenance works in the port and the degradation of its role also resulted in the degradation of the “Neoria”, which were now used as military storage spaces. From the initial “Neoria” complex with 17 “Neoria”, nine were demolished. Nowadays, a group of 7 continuous domes is preserved-along with another one further to the west, the “Grand Arsenal” (today, the Center of Mediterranean Architecture). From the “Moro” complex, only two “Neoria” are preserved intact, at the heart of the port. In their initial formation, the “Neoria” were open to the sea which covered a part of the interior, so that the ships could be transferred easily. They were covered with domes and were connected through arched openings on the walls. The entrance to “Neoria” was possible through 2 gates: one on the south side of the 9th “neorio” and another on the west side of the 17th “neorio”. The “Neoria” were 500 m. long, 9m. wide and had an average height of 10 m. On its south side there are the only light openings- a round sky light and two large windows. The main entrance was in about the middle of the complex, at the end of today’s street “Daskalogianni”, where the west half part of the majestic gate is still preserved. After the demolition of the west “neoria”, the gate leads to the plateau that was created. In the position of the demolished “Neoria”, the stone building of the customs of Chania was constructed, which is today surrounded by two plateaus. The Grand Arsenal is the last of the 17 “Neoria” (Venetian Dockyard) to the west. Its construction started in1585 by the Intendant Alvise Grimani. The thickness of its walls, its isolation from the rest of the “Neoria” and the public services it hosted through time assign the importance of this building and might explain why it is called “Grand”. With the addition of a second floor in 1872, during the Turkish period, a new era began for the “Grand Arsenal”. Since then, the building has hosted several important public services and activities. For example, here is where the school of the Christian Community was hosted. Since 1892, it has also hosted several theatrical performances in the large chamber. It was also used as a public hospital in 1923, and as a City Hall from 1828 until 1941. Nowadays, it has been transformed into an impressive building that hosts various exhibitions and events. It also hosts the Center of Mediterranean Architecture and important Greek and International events related to architecture. The Proto-Minoan settlement that is presently excavated in the city of Chania has the hill of Kasteli as its center. Large habitations with well-built rooms, elegant floors, decorated walls, door frames and ceramics are some of the findings that indicate the existence of a significant proto-Minoan center. This settlement is the most important ancient settlement of west Crete. Its geographical position was ideal, not only because it was next to the sea, but also because it was surrounded by the rich valley of Chania. Thus, the location encompassed all the requirements for the development of agriculture, fishery and sea commerce. This fact was confirmed by the extended excavations that started in 1964 and continue until today. The hill was continuously inhabited from the proto-Minoan years until today, and that makes the excavation works and research difficult, as the excavation layers are numerous and thin, making the dating and correlation of the findings extremely difficult. During the mid-Minoan period (1st half of the second millennium B.C), the settlement develops into a dynamic center. It is the period when the first palaces are built in Crete. While the economy still depends on agriculture, at the same time commerce and navigation develop rapidly. Commerce centers are created outside the island and colonies are expanding. Such commercial relations connect Crete with the nearby island of Kythira. The similarities found on the ceramics of “Kasteli” in Crete and “Kastri” in Kythira is a characteristic example of these relations. Unfortunately, the mid-Minoan construction phases of the settlement of Kasteli have been destroyed by the extended construction activity in the following historical periods, and only a few remains have been found. The construction remains of the proto-Minoan and mid-Minoan periods have been located in different parts of the city of Chania (around the municipal market and further to the east) and indicate the organization of the ancient settlement, which had the hill of Kasteli in the old port as its center. 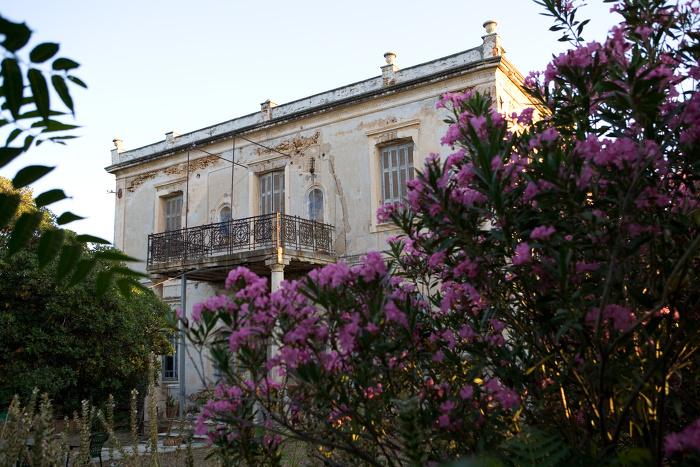 he Palace is located in Halepa, right next to the house of Eleftherios Venizelos. It was built in 1882, and it is a classic example of a noble house of its time, characterized by simplicity. In 1898, after the declaration of the Autonomous Cretan Regime, the building became the house of the High Commissioner Prince George, and since then the building has been called “the palace”. After the departure of Prince George in 1906, the house was assigned to the next High Commissioner, Alexandros Zaimis, who modified the interior and exterior of the building. In the following years, the house hosted several General Commanders of Crete. From 1957 to 1940, the Army Hospital was hosted there, while during the occupation it was used as a Command Post by the Germans. The area where the house of the Venizelos family is built, at the homonym plateau of Halepa, was bought by Kuriakos Venizelos in 1876. The construction of the house was completed in about 1880. The morphology of the house of Venizelos is similar to the other nearby houses of Halepa. The two-story house has the auxiliary spaces on the ground floor, the bedrooms and the large hall on the first floor, where there was also an exterior stone-made staircase that led to the garden. The garden had several kinds of trees, a vineyard, olive trees, and a small house surrounded by a wooden fence. After the death of Kuriakos Venizelos, the house was inherited to his son Eleftherios and his family. After his political success, Venizelos leaves Crete and establishes in Athens. Since his departure, the house was rented to several notorious persons until 1927. Then, Eleftherios Venizelos returns to Crete and renovates the house in order to live there with his second wife, Elena. Today the house is preserved as it was after the renovations of Eleftherios Venizelos, who transferred the hall on the ground floor and left the bedrooms on the first floor. 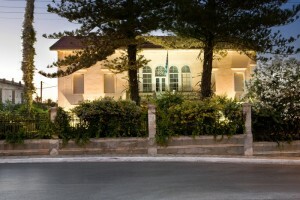 Nowadays, the house hosts the Eleftherios Venizelos Foundation. In Halepa, before you encounter the Palace and the house of Venizelos, there is the building of the former French School of the nuns, of the St. Joseph order. It is a spacious building, surrounded by a fence-wall. The school offered high quality French courses- which was then the “international language”- to many generations of rich girls. The Church of Aghia Magdalene was built in 1901-1903 by the High Commissioner of Crete, Prince George, and was dedicated to Mary Magdalene in commemoration of a visit of his sister Maria to Chania, the wife of the Grand Duke of Russia. This is a church with a wide-angled nave ending in a Russian style dome. It is surrounded by a perimetric arcade. The inauguration took place on 6th January 1903 in the presence of Queen Olga of Greece and Prince George. On his departure in 1909, the prince assigned the church to the Municipality and the parish of Halepa, as an act of devotion to the community of Halepa and in memory of the pleasant years of his stay. The space where the church was built of the Annunciation was open and in the south there was the stable of the Turkish cavalry, “the kislas”, which after the departure of the Turks housed the Russian Constabulary. The land was ceded by the Cretan State for the construction of a large parish church that would serve the needs of the region Fakothianon. The Cretan State granted although the site but could not afford nor penny for the construction of the temple. With fundraisers, sweepstakes and various donations a sufficient amount was collected and the government engineer Miltiadis Mylonas donates the necessary plans for the erection of the church. On 8 October 1908, in the presence of Alexander Zaimis founded the Church of the Annunciation and the greater erection until the coronation of the facade. Now begins the toughest part of the project, housing and bell towers that require a lot of money. It is then thought to extend the fundraising abroad and especially in orthodox countries in Europe and America where they have begun to take root the first Cretan immigrants. So the pistachio George Papadoyannakis after equipped with appropriate documentation started for Russia and other Christian countries of Europe. The results of this trip were amazing. Apart from the money Papadoyannakis brought exquisite ecclesiastical, mainly from Russia, such as the large central chandelier, the great bell, the epitaph and other precious objects. The construction continued after transition Papadogiannaki in America for raising money. The Church of the Annunciation is the largest of Chania, built in cruciform shape with a dome and has a strong classical element. The walls were made of carved stone decorative architectural elements. The design and supervision of construction of the dome and steeple commissioned the architect Anastasios Logothetis from Syros, who had been initiated on the outside, the secrets of the then new-onset concrete. So restructures and temple made by cement material was then used for the first time in Crete. On 12 August 1923 the Church of the Annunciation in Chalepa Fakothianon inaugurated by the Bishop of Chania Agathangelos Ninolaki. wall of the acropolis of Kasteli was probably built during Roman period (69 B.C – 330 A.D), and is founded over the remains of an older fortification of the Hellenistic period. The larger part of the Byzantine wall was constructed by the ruins of ancient Kydonia, which were used as building material. Its outline is irregular and consists of rectilinear parts interrupted by small oblong or polygonal towers. In some parts, the wall simply complements the natural fort created by the rock. The wall had four gates, from which none preserved its initial formation to our days. The rampart Sabbionara still preserves its Turkish name “koum – kapi” (Kum Kapisi = the Gate of the Sand), is located on the northeast corner of the Venetian walls and is completely constructed in the sea. On the front of the rampart, the circular Venetian emblem of the lion of Agios Marcos is still preserved. It is the only preserved gate today and its external side had been modified during the Turkish period. It is the only preserved gate today and its external side had been modified during the Turkish period. The port of Chania cannot be used by modern ships because of the shallow water, which contributed in preserving its old character, maintaining the signs of its conquerors till today. The Catholic church was built in 1842 by the Capuchin Monks and it was devoted to Virgin Mary. The Catholic Church is the main Catholic Diocese on the island of Crete.The Capuchin monks arrived in Chania by order of Pope Pawl the 5th in 1566, led by father Ingatius the D” Ariton and founded the first monastery in Crete. In a small space they opened a hospital in the building adjacent to the church, which they called “college”. The building of the monastery of the Capuchin monks, built in its present form in 1842 and expanded with the addition of a wing in 1860. This temple is recorded in the 1637 church inventory as a parish temple, the property of the family Skordili – Marafani. It has been altered through time. On its east side there were the arches of the sanctuary. Its north aisle has been incorporated to the ground floor of a habitation of the Turkish period. The navy museum is located at the entrance of the Firka fortress and it was founded in 1973. The purpose of the Museum was to promote the island’s nautical tradition Inside there is a big collection of sea relics, photos, uniforms, ship models, shells, up to 2500 pieces. Its work is also very important since the staff of the Museum has created a model of a Minoan Ship, as an example of the first civilization of the island, the Minoans, dating back to 2nd century B.C. The Jewish district of Chania was located on the northwest part of the city. The street “Kondylaki” used to be the central street of the district, where the houses of famous Jewish families were located. The Synagogue of Kehal Hayyim is still preserved on a cross street of the street “Kondylaki”. The Italian archeologist Gerola argued that the synagogue used to be the Church of Aghia Ekaterini, based on a map of Coronelli. It is a single-aisled dome shaped building with two additional spaces on the south related to the Jewish Mass. All the Jewish people of Chania were killed during the WW2, when their ship sunk outside the port of Chania.